The Chesapeake Oyster Alliance (COA), a new coalition of non-profit groups, corporations, and universities in Virginia and Maryland, are working together to achieve a lofty goal: introduce 10 billion new oysters into the Chesapeake Bay by 2025. As oyster larvae grow, their shells accumulate algae and sediment from their surroundings. According to the Chesapeake Bay Program (CBP; Annapolis, Md. ), which coordinates bay restoration efforts across six states, the District of Columbia, and federal agencies, a single adult oyster can filter contaminants from about 50 gallons of water each day. Nearly 40 partners ranging from oyster-farming companies and marina managers to conservation and research groups have joined COA since its establishment in February 2018. By focusing on fundraising, research, and volunteer coordination, COA’s oyster-seeding initiatives will help fulfill goals set by CBP’s 2014 Chesapeake Bay Watershed Agreement. One such goal is to restore impaired oyster reefs to healthy conditions in ten Bay tributaries by 2025. Partners also will support the growth and expansion of the commercial aquaculture industry along the eastern shore of Maryland and Virginia. Incentivizing sustainable business practices that improve bay health also creates new jobs in communities along its coastline, COA partners said in a press release. 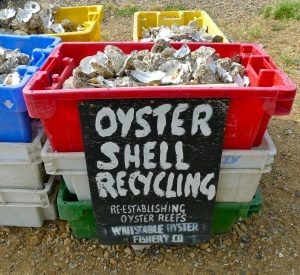 In support of COA’s push toward 10 billion new oysters, an experimental project to build a large network of manmade oyster reefs has been underway by the Chesapeake Bay Foundation (CBF; Annapolis, Md.) since April. In a CBF release announcing the deployment of 240 “reef balls” just north of the Severn River Bridge near Annapolis (Md. ), project scientists expressed hope that the artificial reefs would disrupt wildlife-killing dead zones of low oxygen that develop each summer in the river. The reef balls — round, concrete structures each measuring about 2-ft.-tall — are covered with oyster larvae that attach themselves to the balls just as they would to natural reefs formed by old shells. 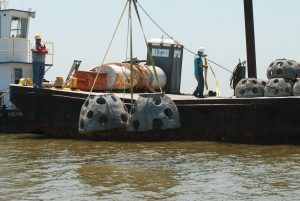 In addition to filtering contaminants from the river and creating new habitats for aquatic life, scientists are testing whether the vertical reef-ball structures, which stand out above flat oyster beds throughout the Bay, can increase dissolved oxygen contents by creating turbulence in river currents. CBF estimates that about 400,000 oyster larvae were seeded as part of the experiment. “We know historic oyster reefs grew up into the water column. They looked more like mini Manhattan skylines than the flat oyster beds we think of today. This project will test whether man-made oyster reefs with vertical structure agitate currents and break up dead zones,” said CBF Maryland fisheries scientist Allison Colden. While CBF and other conservation groups have planted similar reef balls in the past, this batch comes equipped with specialized sensors developed by the University of Maryland Center for Environmental Science (Cambridge, Md.) that will monitor how they affect river currents and dissolved oxygen. CBF will work with the university and the U.S. Naval Academy (Annapolis, Md.) to monitor the reef balls’ effectiveness in mitigating dead zones over the summer. Ongoing efforts by Chesapeake Bay-focused partnerships already have resulted in considerable improvements to the water quality of the nation’s largest estuary. Last December, CBP announced that almost 40% of the Bay and its tidal tributaries had met water-quality standards set by the Chesapeake Bay Watershed Agreement for clarity, oxygen content, and algae growth between 2014 and 2016. This marked a “near-record high” based on the group’s decades-long history of monitoring the bay’s health. Earlier this year, CBP also announced that about 42,500 ha (105,000 ac) of underwater grasses had been mapped in the Chesapeake Bay, the highest amount ever recorded. Since underwater grasses are highly sensitive to pollution, scientists attribute their resurgence to early successes toward long-term pollution reduction mandates set by the U.S. Environmental Protection Agency.